From prom night slashers to summer camp decapitators, our Halloween party this year was a tribute to all of the highly inappropriate teenage slasher films we probably should have never watched as kids, but totally did. A wild time before Wi-Fi when you actually had to leave the house (THE HORROR!) to rent a movie, in a long-dead format called… VHS. The sleepless nights that followed were the inspiration for this 80’s style Slasher Bash that is our loving tribute to the horror movies of the 70’s and 80’s. 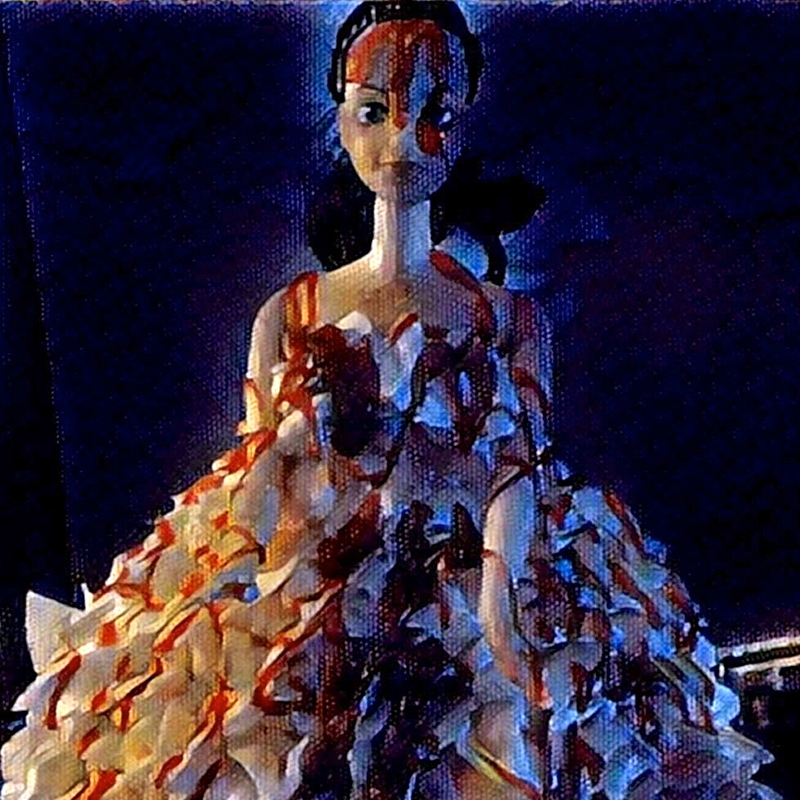 The music, food and décor were all inspired by that time period starting with a red velvet tribute to our favorite prom queen, Carrie. We guarantee that no one will laugh at you if you serve this cake at your next Halloween gathering or Netflix Horror viewing party. A single or double recipe of Red Velvet Cake. Made from your favorite homemade recipe or from cake mixes following the instructions on the box. You need about 6-7 cups of batter. 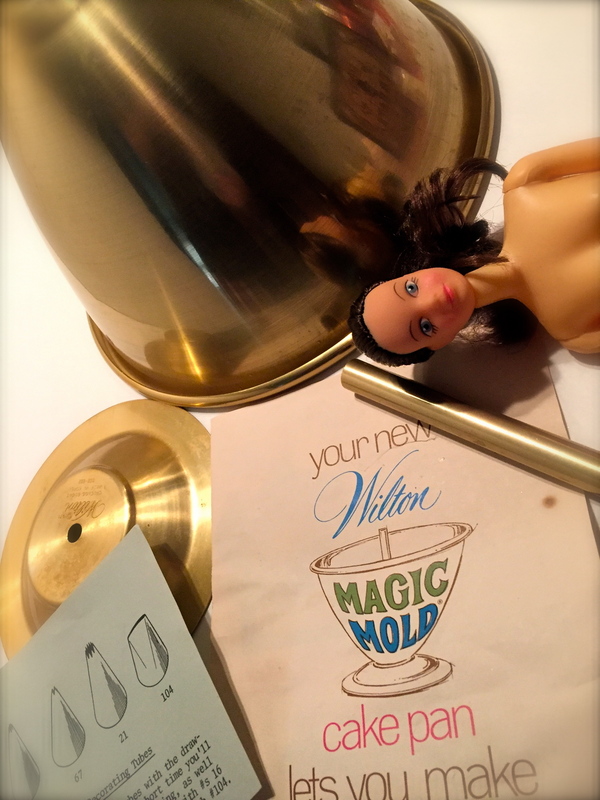 A Wilton Doll Classic Cake Pan https://www.amazon.com/Wilton-Doll-Classic-Wonder-Barbie/dp/B00A76NXX8 We used my mom’s original Wilton cake pan from the 70’s. This very pan was used to make many of my own childhood princess/Barbie birthday cakes. Pam Baking Spray or a combination or vegetable shortening and flour. Cream Cheese Icing. Can be either homemade from your favorite recipe or your favorite store brand. Preheat your oven to 350 F or temperature in the directions of your homemade recipe. 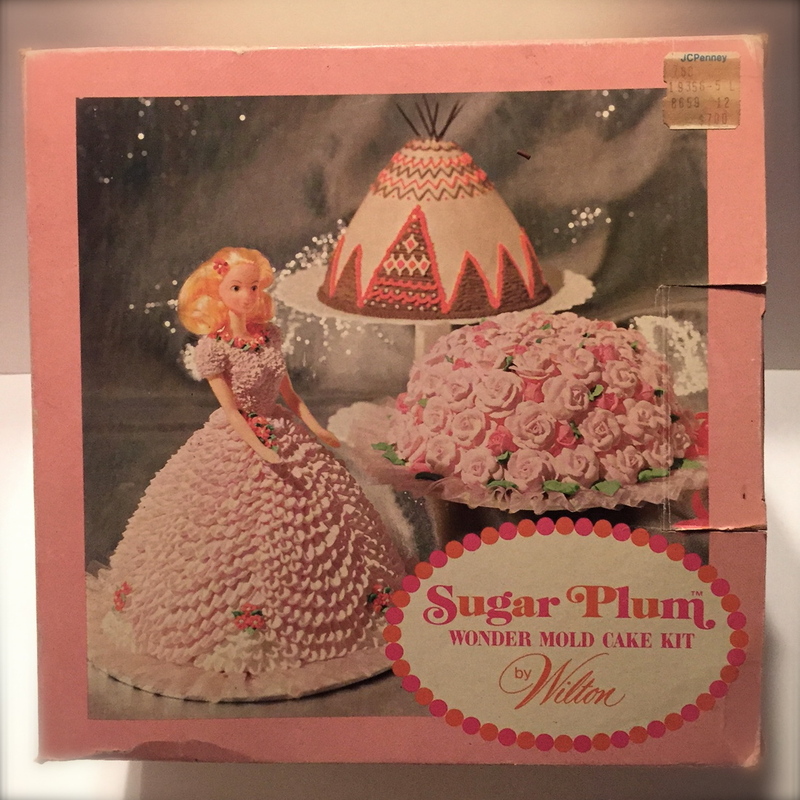 Following the directions on the box, assemble your cake pan making sure that the center tube is in place and the pan is standing upright on its base. Finish preparing your cake pan by covering it well with the baking spray or a combination of the solid vegetable shortening (do not use butter, margarine or liquid vegetable oil) and flour. If using the shortening, sprinkle about 2 Tablespoons flour inside pan on top of the shortening and swirl it around until the flour covers all of the greased surface. Once covered, turn your pan upside down and tap lightly to remove excess flour. Make both cake mixes according to package or recipe directions. We mixed them together in one large bowl. The recipe with our pan called for two mixes, but we used only a small amount of the second mix. The recipe called for 6 cups of batter, we used 7 and made cupcakes with the rest. Pour the batter into the pan and bake on the middle rack of 350 F oven for 70-85 minutes or until cake tests done according to recipe directions. We suggest putting the pan on top of a cookie sheet just in case. Remove the cake from the oven and let it cool on cake rack for about 10 minutes. Remove the center tube from the cake. To remove your cake from pan, place a cooling rack against it and turn both the cake rack and pan over. Then lift the pan off carefully. Let your cake cool for at least one hour. Then transfer it to a serving board or plate, by holding a cake board against it and turning both the cake and the rack over. To decorate: spread a thin layer of icing on the cake. Add an extra dollop of icing at the top and position your doll in the center. Put your cake in the fridge for about 10 minutes to set up. Using your decorator bag and star tip, pipe individual stars starting at the base of your doll and going down tin a straight line to the bottom of the skirt. Do this around the whole cake until every inch is covered. Then pipe small stars around the doll to finish the top of her dress. At this point we put the cake back in the fridge to set up again, but you can add the red sparkle gel icing now if you like. Follow the directions on the package to cut open the icing tube. (If you concentrate really hard you might be able to do this step with your mind. If not, we suggest using scissors.) 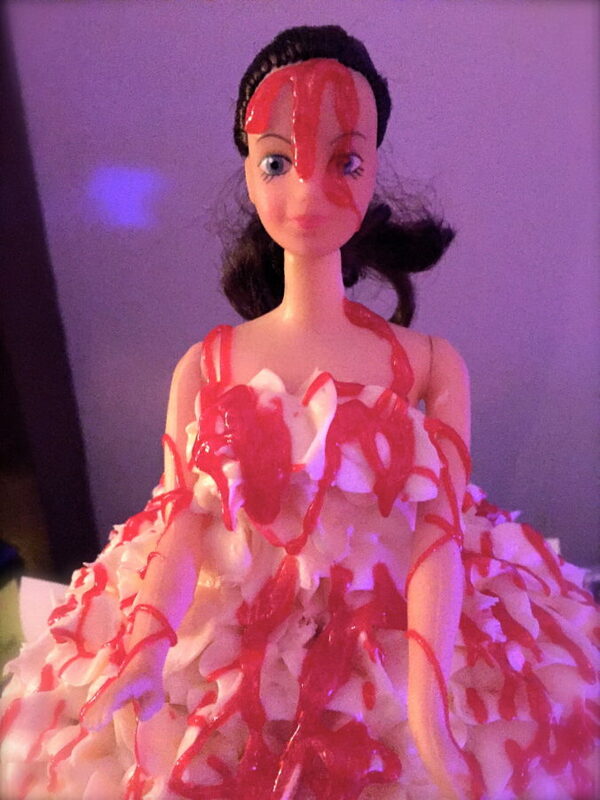 Starting at the top of the dolls head, go around and around dripping the gel icing down to look like blood.